Our firm provides legal representation with a global perspective. As companies continue to identify opportunities for growth and expansion beyond the local marketplace, the need for a law firm that can easily accommodate the legal issues associated with these activities becomes paramount. For those clients, the Law Offices of Peter C. Merani P.C. assist in providing seamless regional, national, and international legal services throughout the world. We respond quickly and efficiently to your needs for cross-border services. We can hold meetings in over 50 countries worldwide. International law is a broad and diverse practice. We provide strategic advice to domestic and international private-sector entities on international law and policy. As our client, you gain immediate access to some of the most highly respected law and accounting firms in the world while retaining our active involvement in the legal process. 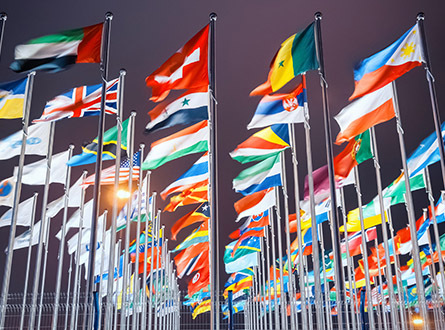 These firms possess not only an intimate knowledge of the local language and laws, but also of the customs, practices, and court systems in each country. This knowledge is a priceless benefit. As a result, matters are promptly handled in the appropriate jurisdictions. The Law Offices of Peter C. Merani P.C. is a New York City firm with a small-town perspective. Our attorneys provide you with personal attention to your legal needs and the highest caliber of legal services at affordable, competitive rates. Consult with experienced attorneys who work diligently to draft sound enforceable contracts designed to protect your rights, land, and royalties. We pride ourselves on our unique ability to craft innovative legal strategies designed to meet your needs and goals. Litigation can threaten a company's very existence. Our attorneys have extensive experience litigating challenging, intense, and diverse matters. We are widely recognized for our ability to handle your most critical litigation issues effectively.